His Eminence Khotrul Jurme Dogyud Gyatso Rinpoche, renowned as His Eminence Khochhen Rinpoche, was born in 1937 in Gonjo Dodrup in Eastern Tibet. He was recognized as the reincarnation of Namdrol Sangpo Rinpoche of Khochhen monastery at an early age by His Eminence the 8th Mindrolling Khenchen. Tersay Chime Rinpoche, who was the elder brother of Dzongsar Khyentse Chökyi Lodrö, formally enthroned Rinpoche at Khochhen monastery. Rinpoche undertook his studies at Mindrolling in Tibet where he studied and mastered Buddhist philosophy, psychology, tantras, astrology, poetry, literature, calligraphy and rituals. He received profound teachings and instructions from eminent masters such as Dzongsar Khyentse Chökyi Lodrö, Minling Chung Rinpoche and Minling Khen Rinpoche. Rinpoche was at Mindrolling for well over ten years until the Communist invasion in 1959. Following the invasion, Rinpoche, at the age of 22, escaped into exile in India as one of the seven-member entourage of His Holiness Mindrolling Trichen. In 1965, with a small group of monks, he selected a piece of wilderness land near Dehra Dun thought to be an auspicious location for the monastic seat of Mindrolling in exile. This tiny band of monastics began to transform the rough land by building monk’s quarters and the main shrine room. They then invited His Holiness to assume leadership there in 1976. 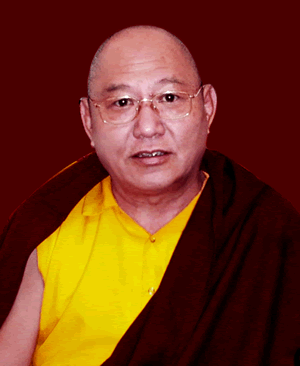 Since the establishment of Mindrolling in India, the His Eminence Khochhen Rinpoche has worked tirelessly for the construction and maintenance of the monastery. His efforts and perseverance have played a major role in every stage of development over the years. Besides being the principal of the Mindrolling Monastery, Rinpoche has served as President of the Tibetan community of Clement Town since the year 1987.